The Bacon Factory at Elmswell has seldom been out of the news since it was opened on May 30th 1911, ‘. . . bringing new jobs to the village. . .’. It also brought the problems of ‘industry’. On 27th December 1918, the Parish Council resolved to delegate 2 Councillors to visit the Factory manager to discuss ‘Nuisance from the bacon factory’, and ask that his enterprise, ‘consume their refuse or dispose of same without carting it through the village.’ In 1959, the MP for Bury St Edmunds spoke in the house during a debate on the bacon industry to point out that ‘I have in my constituency a bacon factory which is working to just under one third of its normal capacity’. Six years later, Mr. Andreasen, who had worked his way up from bookkeeper to General Manager and Secretary in 50 years of service, retired with the words ‘. . there isn’t sufficient profit in the industry to make it attractive’. 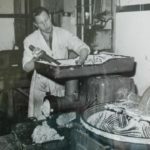 In his day, the factory had expanded from 18 people handling 700 pigs per week to some 200 employees dealing with 2000 kills and the processing which followed. In 1978, aided by a grant of £444,333 from the EEC, an expansion programme sought to employ ‘typists, process workers, technicians, salesmen and managers’… this some 4 years after there had been, painfully, redundancies. The enterprise had, famously, begun as a farmers’ co-operative when ‘five and a half acres situate quite close to the great Eastern Railway line at Elmswell’, were chosen to house ‘a factory modelled on the latest style of the co- operative factories in Denmark’. Eastern Counties Farmers, Harris Pork & Bacon and, finally, Grampian Country Foods were successive owners. In 1995, during Harris’s tenure, a familiar headline: ‘Families reeling at meat firm jobs axe’. 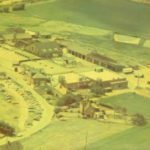 The East Anglian of 7th June that year wrote, ‘For workers at Elmswell the problem is compounded because of the factory’s village location. . . whole families work there, husbands and wives, sons and daughters, sons-in-law and daughters-in-law… they are stunned and shocked’. The Chairman of the Parish Council at the time presciently suggested that ‘ There is nothing to suggest that this is not a one-off rationalisation move, but it does not stop people thinking that this is the thin end of the wedge’. Our current Chairman was equally wary following discussions with the Factory on news of the recent impending closure: ‘… only 1 or 2 employees will be offered jobs at the company’s other sites’. No-one could have predicted the massive changes in the meat trade, in eating habits or in commerce which have finally closed the Bacon Factory. At the time of the last scare, the concepts of globalisation, out-sourcing, off-shoring and food air miles were mere twinkles in the eyes of the trend predictors. Grampian themselves fly in prepared product from Taiwan. It is the way of the world, a world that is shrunk by the ease of subsidised jet travel, a world that is tilting Eastwards, a world that is unremittingly cost aware and yet increasingly blind to real value. The response to the end of the Factory, just 5 years short of its century, has been heartening. As much practical help as can be offered to the redundant staff will be available – from the humble scope of the Parish Council’s resources to the wider-ranging powers of the East of England Development Agency. And there is hope of a vision which could bode well for the future. A 42-acre site, either within or abutting the existing development envelope of the village, is a very attractive prospect. Elmswell has learned, in recent history, to be wary of those who would like to help ‘develop’ the site. Mid Suffolk officers have been commendably quick off the mark in suggesting that only a ‘sustainable’ way forward would be acceptable. It would not be difficult to replace all of the 380 jobs, given the scale of the site. The Planning policies exist if the will and determination are there. The Parish Council currently demonstrates those qualities and has the necessary skills and experience to set the ball rolling in the right direction. But this is a long job. Only within the next decade will the full import of the possibilities, the threats and the opportunities be realised. Within a year there will be a new Parish Council. In June a Government White Paper is likely to suggest a radically new framework for the District and County tiers of Local Government. After 95 years Grampian-Harris finally stopped production at its bacon factory on 9th June, closing officially on the 14th. Already within only a few days the machinery has been moved out, and the buildings which were the background to the daily working lives of so many local people seem gaunt and strange in their emptiness. 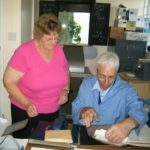 For this was indeed a very local enterprise – although since the 1970s the ownership moved ever further off, those working for the factory were largely from Elmswell and the surrounding villages, and often several members of the same family were employed there. 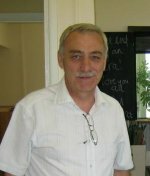 Geoff Cardy, personnel manager, has the highest praise for the staff. “They’ve been brilliant: through all the changes which have been necessary for us to survive in the highly competitive food industry, they have showed tremendous flexibility, and an abiding loyalty to the firm – often for 25 years or more. They have been good mixers, accepting and helping the east-European and Portuguese migrants who have joined the workforce in recent years. They are hard-working, knowledgeable and reliable people, and I commend them warmly to other prospective employers.” The closure has been a time of deep sadness, but there has been no vindictiveness and many saw the company right through to the last day. Among those who served longest we may recall George Cobbold, who was given a 50-year service award; and Stefan Klaczok, who must have served the company for well over 50 years: he came from the Ukraine before the war and worked as a butcher – but in his retirement he carried on as groundsman until his sudden death recently at age 83. 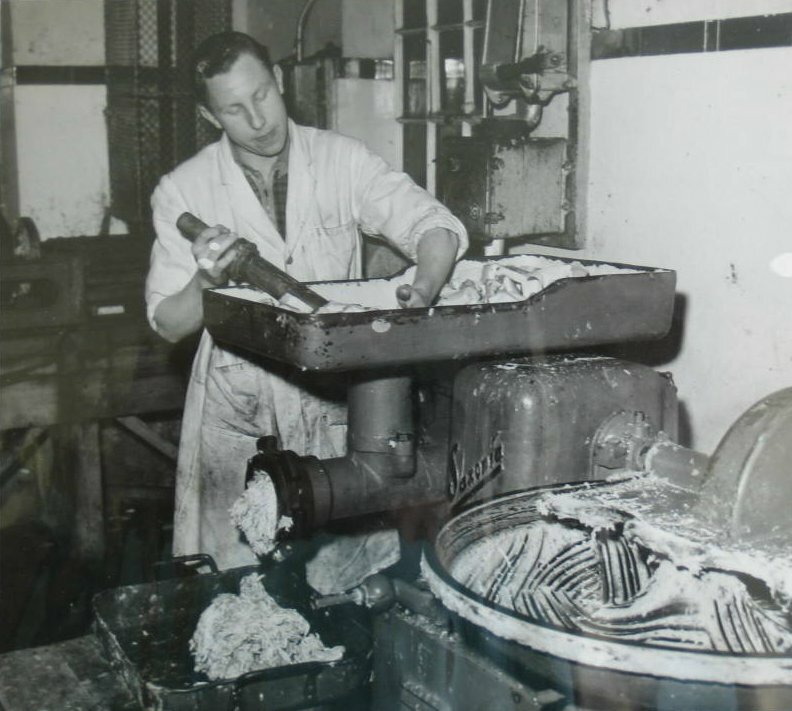 Quality was always top of the list at the St Edmundsbury Bacon Factory, which had a reputation as a “cutting-edge” facility (the pun may or may not have been intended) and won many awards for its products. King George V was a valued customer (see photo), and the company received a Royal Warrant to supply Buckingham Palace and Sandringham. Few of Tesco’s many suppliers could boast a “blue” rating on their grading system. 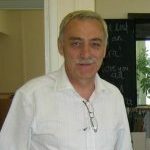 Elmswell Pork Pies were the best you could buy, (claims Val Ling – proudly and quite rightly); mouth-wateringly excellent sausages were provided on contract to many East Anglian schools. There was beautiful pure white lard (in the days when one was still allowed such proper food) and you could make wonderful pastry with it (in the days when folk still made their own pastry). Val was born in one of the cottages actually within the company compound, built in the early years and removed in the late 1970s; her grandfather Walter Waller was Chief Engineer at that time, and for a while both her parents worked at the factory. She recalls that the cottages had no bathrooms, so bathtime on Fridays was conducted in the slaughterhouse! And in those days of lower hygiene standards she used to accompany Percy Bloomfield catching rats behind the factory on a Saturday afternoon. 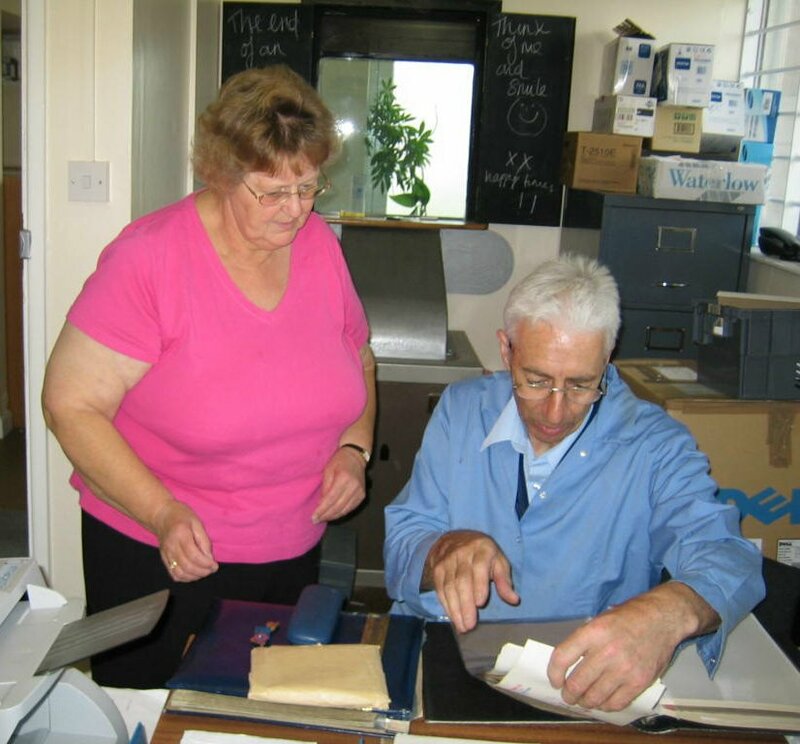 Val herself has put in 45 years service since she started as a teenager, booking in the live pigs as they arrived by the lorry-load; subsequently she worked in several other departments, including accounts, cashier, and personnel. So it’s “farewell” to the St Edmundsbury Bacon Factory. Elmswell may be sad for its passing, but justly proud of what it achieved in its century. 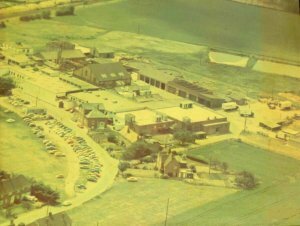 Aerial photo taken in 1976 The largest sloping roof covered the old pie room, and to its left the next largest was the power house; the railway siding was just in front of these. Along the roadway the big brick building was the main office, with its boardroom on the top floor; to its right the row of three “cottages”, and then the pair of semis which still stands, lately housing Reception. Val Ling and Kenny Pearson review some old photos for our archives.